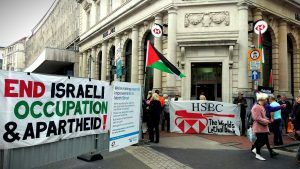 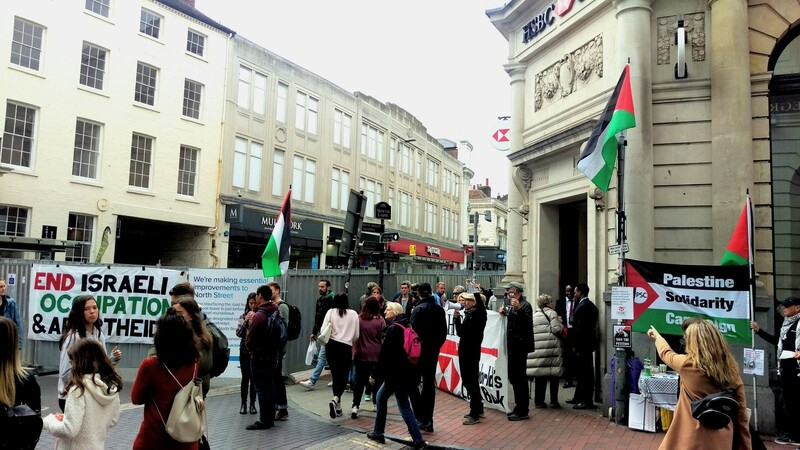 Once again, dozens of local people protested today at the main Brighton branch of HSBC Bank, angry over the bank’s complicity in the deadly two-way arms trade between the UK and Israel. 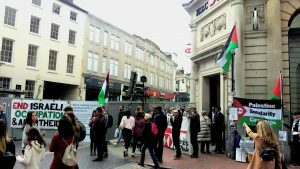 The protest was part of the UK-wide STOP ARMING ISRAEL campaign. 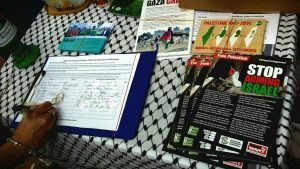 The campaign is co-ordinated by a coalition of human rights organisations, including Palestine Solidarity Campaign, War on Want, Campaign Against Arms Trade, the Boycott Israel Network and the Palestinian BDS National Committee. 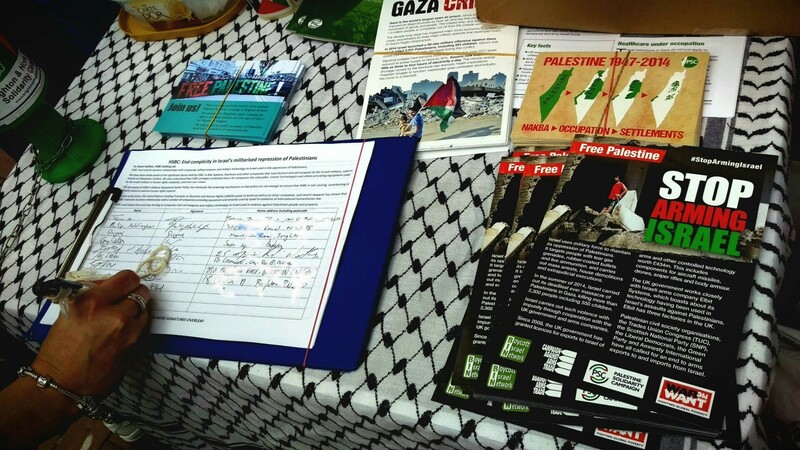 Hundreds of leaflets were distributed to the public, and scores of people signed our petition demanding that HSBC immediately cease its business dealings with Israel’s deadly arms trade. 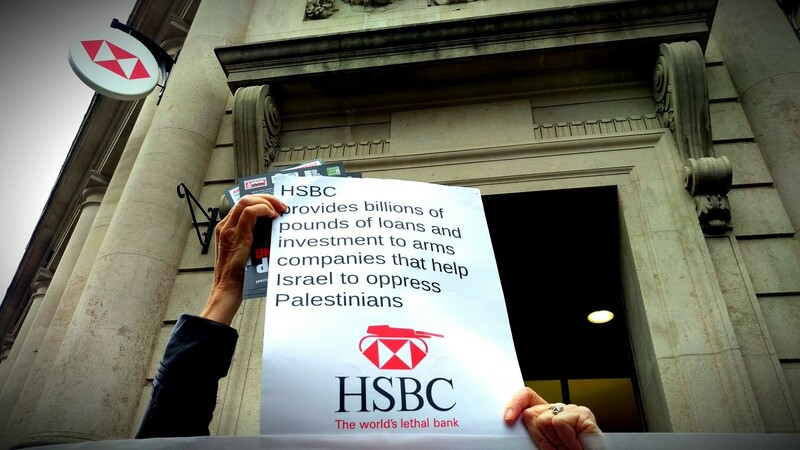 Many HSBC customers were shocked and angry to discover that their bank helps to fund the UK arms trade with Israel, and made a commitment to demand that the bank divest from this deadly business. 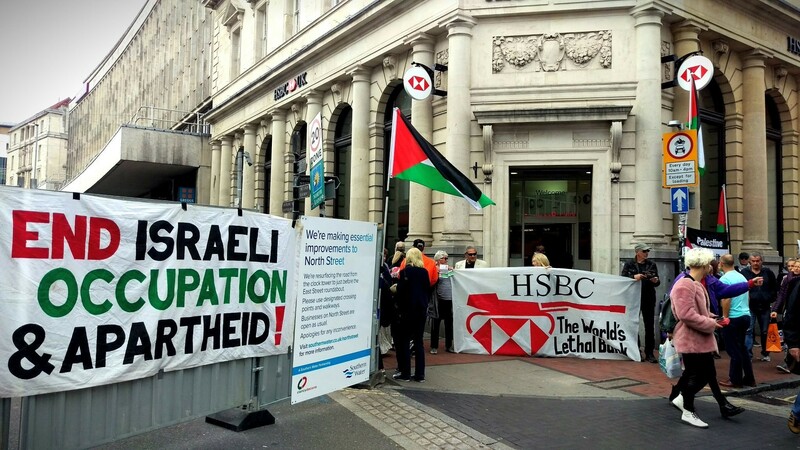 They were especially concerned to learn that HSBC’s business with BAE Systems, Raytheon, Caterpillar and United Technologies actually contravenes their own Defence Equipment Sector Policy, as well as the United Nations Guiding Principles on Business and Human Rights. Any HSBC customers wishing to protest to their branch managers are welcome to use our template letter as a basis for their own.